湖泊科学 2016, Vol. 28 Issue (1): 68-74. DOI: 10.18307/2016.0108. 徐洋, 陈敬安, 王敬富, 罗婧, 氧化还原条件对红枫湖沉积物磷释放影响的微尺度分析. 湖泊科学, 2016, 28(1): 68-74. DOI: 10.18307/2016.0108. XU Yang, CHEN Jing'an, WANG Jingfu, LUO Jing. The micro-scale investigation on the effect of redox condition on the release of the sediment phosphorus in Lake Hongfeng. Journal of Lake Sciences, 2016, 28(1): 68-74. DOI: 10.18307/2016.0108. 摘要：选取贵州红枫湖为研究对象, 在实验室条件下模拟了自然、好氧和厌氧条件下沉积物内源磷的释放过程, 联合应用微电极技术和沉积物磷形态分析对沉积物-水界面开展了微尺度观测与研究.结果表明, 厌氧条件下红枫湖沉积物总磷含量显著降低, 且主要是NaOH提取态磷(NaOH-P)和残渣态磷(rest-P)含量降低所致, 厌氧条件下沉积物孔隙水中磷酸盐浓度明显升高, 而好氧条件下沉积物孔隙水磷酸盐浓度显著降低, 反映厌氧条件显著促进了红枫湖沉积物磷释放.厌氧条件下沉积物内部溶解氧浓度下降、硫还原活动增强可能是导致NaOH-P释放的主要原因.O2浓度的降低加速了沉积物还原作用并产生大量H2S, 进而与二价铁离子形成硫化亚铁沉淀, 最终导致NaOH-P(Fe-P)释放到孔隙水中.好氧条件向厌氧条件的转换可通过改变沉积物内部pH值分布和微生物活动促使rest-P释放:厌氧条件下, 厌氧微生物不仅可以消耗硫酸根产生H2S, 导致pH值降低, 还可消耗有机质, 将有机磷转变为无机磷.上述研究结果表明, 沉积物-水界面氧化还原环境可影响沉积物氧渗透深度、pH值分布、微生物活动、硫循环以及有机质降解过程, 进而控制沉积物磷的形态转化与释放.联合应用微电极技术和沉积物磷形态分析对湖泊沉积物水界面开展微尺度观测研究是揭示沉积物内源磷释放机制与控制因素的有效途径. Abstract: In this paper, Lake Hongfeng, located in Guizhou Province, was chosen to study the release process of the sediment phosphorus under the natural, aerobic and anaerobic conditions. Microscale observation of the physical and chemical properties of sediment-water interface by microelectrode technology was used, together with traditional P-speciation analysis, to explore the P-releasing mechanisms. 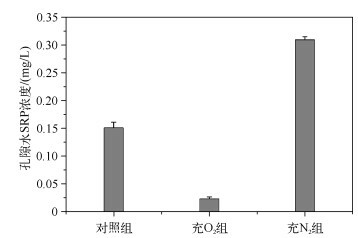 The results showed that under anaerobic conditions, the total content of phosphorus in the sediment in Lake Hongfeng decreased significantly, which was mainly caused by the reduction of NaOH-P and rest-P, indicating that the aerobic condition promoted the phosphorus release from sediments. The concentration of phosphate in the pore water of sediment increased greatly under anaerobic condition, and the trend was contrary to that under aerobic condition. 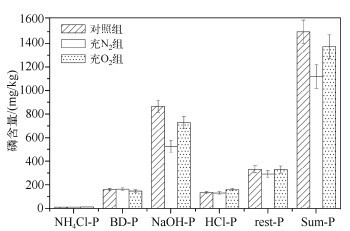 Under the anaerobic condition, concentration of dissolved oxygen decreased and sulfate reduction was enhanced, which released NaOH-P from the sediment. Decrease of O2 accelerated the sediment reducing processes and produced a large amount of H2S, which combined with ferrous icon to form the precipitation-ferrous sulfide, resulting in release of NaOH-P(Fe-P)into the pore water. The conversion of aerobic to anaerobic condition could promote the release of rest-P by changing the distribution of pH value in the sediment as well as microbial activities. Under the anaerobic condition, anaerobic microorganisms could not only contribute to the sulfate reduction and H2S production, leading to pH decrease, but also consume organic matter and convert organic phosphorus into inorganic phosphorus. The redox environment of sediment-water interface could affect the penetration depth of sediment-oxygen, pH distribution, microbial activity, sulfur cycle as well as organic matter degradation process, which controlled the speciation transformation and release of sediment phosphorus. Microelectrode technology, together with traditional P-speciation analysis, is an effective way to reveal the release mechanisms of sediment phosphorus as well as the control factors. 实验结束后，利用微电极测量系统(丹麦Unisense公司)对不同培养条件下的沉积物-水界面溶解氧、H2S以及pH值进行微尺度剖面测定.O2的穿刺步进设为100μm，测量及响应时间设为16s；H2S以及pH值穿刺步进设为300 μm，测量及响应时间设为20s.测量结束后，将沉积物柱芯按照0~1、1~2、2~3cm、……进行分层取样，离心获得孔隙水，测定孔隙水中的溶解态活性磷(SRP)浓度以及沉积物中磷的赋存形态.孔隙水SRP浓度采用钼锑抗分光光度法(GB 11893 1989)测定，沉积物磷赋存形态采用Hupffer等发展建立的化学连续提取法进行测定(表 1). a. NH4Cl 1 mol/L 孔隙水中松散吸附在物质表面的(如铁和CaCO3表面)立即可用的磷, 即弱吸附态磷. b. BD 0.11 mol/L 氧化还原敏感的磷, 主要指被铁的氢氧化物和锰的化合物约束的磷. c. NaOH 1 mol/L 溶解性活性磷(SRP)：可与OH－离子进行交换的铁铝金属氧化物约束的磷; 无机磷化合物:主要为铁铝结合态磷; 微生物磷(NRP)：非活性磷、总磷与SRP的差值, 包括碎屑中有机磷和聚磷以及腐殖酸化合物结合的磷. d. HCl 0.5 mol/L 碳酸盐结合的磷和磷灰石磷，微量的水解有机磷, 主要为钙结合态磷. e. 500℃灰化2h HCl 3.5 mol/L 有机磷和其他耐火物质中的磷. 不同培养条件下，沉积物磷赋存形态变化如图 3所示.充N2组和充O2组的沉积物总磷(Sum-P)含量与对照组相比均有不同程度的降低，且充N2组降低显著(降低了378.9mg/kg).这种变化主要是由NaOH提取态磷(NaOH-P)和残渣态磷(rest-P)含量降低引起的.NaOH-P是红枫湖沉积物磷最主要的赋存形态，其含量约占总磷含量的57.8 %，其次是rest-P，约占22.1 %，其余20.1 %为NH4Cl提取态磷(NH4Cl-P)、BD提取态磷(BD-P)和HCl提取态磷(HCl-P).充N2条件下，NaOH-P含量明显减少，而孔隙水中SRP浓度有较大的升高(图 2)，说明NaOH-P释放进入孔隙水和上覆水.充O2条件下，沉积物总磷含量略有降低, NaOH-P含量略微降低是导致此现象的主要原因.与充N2条件不同的是，充O2条件下，沉积物孔隙水中SRP浓度(0.023mg/L)明显低于对照组(0.151mg/L). 秦伯强, 高光, 朱广伟等. 湖泊富营养化及其生态系统响应. 科学通报, 2013, 58: 855-864. 金相灿, 王圣瑞, 庞燕. 太湖沉积物磷形态及pH值对磷释放的影响. 中国环境科学, 2004, 24(6): 707-711. 侯立军, 刘敏, 许世远. 环境因素对苏州河市区段底泥内源磷释放的影响. 上海环境科学, 2003, 22(4): 258-260. 步青云. 浅水湖泊溶解氧变化对沉积物磷、氮的影响[学位论文]. 北京: 中国环境科学研究院, 2006. Kisand A, Noges P. Sediment phosphorus release in phytoplankton dominated versus macrophyte dominated shallow lakes:Importance of oxygen conditions. Hydrobiologia, 2003, 506. Hupfer M, Lewandowski J. Oxygen controls the phosphorus release from lake sediments-a long lasting paradigm in limnology. International Review of Hydrobiology, 2008, 93(4/5): 415-432. 韩沙沙, 温琰茂. 富营养化水体沉积物中磷的释放及其影响因素. 生态学杂志, 2004, 23(2): 98-101. 林艳, 刘亚丽, 段秀举. 双龙湖底泥磷释放强度影响因素正交试验研究. 资源环境与工程, 2006, 20(1): 78-88. Baudo R, Giesy JP, Muntau H. Sediments:Chemistry and toxicity of in-place pollutants. Michigna:Lewis Publishers, 1990, 131-144. 刘素美, 张经. 沉积物间隙水的几种制备方法. 海洋环境科学, 1999, 18(2): 66-71. 许昆明, 胡融刚. 微电极技术在沉积物化学原位测量中的应用. 地球科学进展, 2006, 21(8): 863-869. 王建军, 沈洁, 张路等. 湖泊沉积物-水界面氧气交换速率的测定及影响因素. 湖泊科学, 2009, 21(4): 474-482. Chen JA, Zhang W, Zhang RY et al. 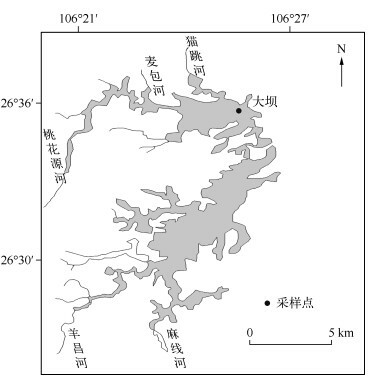 Time and spatial distribution characteristics of nitrogen and phosphorus in the sediment of Lake Hongfeng. 13th World Lake Conference, 2009, 2226-2230. 李键, 张维, 陈敬安等. 一种可实现不同水深条件下采样的湖泊沉积物柱芯采样装置. 地球与环境, 2011, 39(1): 121-124. Crank J. The mathematics of diffusion. Landon: Oxford University Press, 1975. 万国江, 陈振楼, 万曦等. 湖泊沉积物-水界面铁锰循环研究新进展. 地质地球化学, 1996(2): 5-8. 孙慧卿, 王平, 江和龙. 不同模拟条件下太湖沉积物水界面磷行为的研究. 环境科学与技术, 2012, 35(5): 141-146. 许昆明, 司靖宇. 适用于海洋沉积物间隙水中氧、锰Ⅱ、铁Ⅱ、硫分析的金汞齐微电极. 分析化学研究报告, 2007, 35(8): 1147-1150. 吴丰昌, 万国江, 蔡玉蓉. 沉积物-水界面的生物地球化学作用. 地球科学进展, 1996, 11(2): 191-1971. Dade WB, Hogg AJ, Boudreau BP. Physics of flow above the sediment-water interface. In:Boudreau BP, Jorgensen BB eds. The benthic boundary layer:Transport processes and biogeochemistry. Oxford:Oxford University Press, 2001:4-43. 汪嘉宁, 赵亮, 魏皓. 潮滩动力过程影响下扩散边界层和沉积物-水界面扩散通量的变化. 科学通报, 2012, 57(8): 656-665. 王敬富, 陈敬安, 曾艳等. 微电极测量系统在湖泊沉积物-水界面生物地球化学过程研究中的应用. 地球与环境, 2013, 41(1): 65-70. 孙晓杭, 张昱, 张斌亮等. 微生物作用对太湖沉积物磷释放影响的模拟实验研究. 环境化学, 2006, 25(1): 24-27. 龚春生, 范成新. 不同溶解氧水平下湖泊底泥水界面磷交换影响因素分析. 湖泊科学, 2010, 22(3): 430-436.